Can wildlife photography be therapeutic? It certainly has for me, in ways you may not consider. In the aftermath of Hurricanes Katrina and Rita, our family decided to move as far from the Gulf as we could, and still speak Southern. After a long search for the perfect spot, we landed in scenic Cannon County. Change happens. We moved in late November. As our first cold and lonely winter finally gave way to birds and blossoms, I ventured outside. Our driveway is almost half a mile, so I started walking to the mailbox for exercise. Nothing was familiar — plants, trees, or wildlife. Stumbling up and down the rocky hill with a big stick and cell phone, I wondered what boogers lurked in the bushes. What I found instead of rabid coyotes were gentle deer, comical turkey, shy quail, chubby groundhogs, amazing butterflies, and bird species I knew only from books. So I began to carry a camera everywhere. Playing hide-and-seek with our beautiful deer family was a new experience which pried me away from the computer and homesick e-mail. It reawakened the sense of exploration and discovery that keeps us young. Not to mention the evergreen air and lung-pumping hikes. Now when my feathers ruffle, there’s a wandering stream to smooth them out, and countess wonders to remind me of their Creator. Almost five years have passed. Friends come to explore the hill with us, and wade in the creek. Instead of writing lonely e-mails, I send something silly or scenic from a growing collection of images. They also make nice greeting cards, prints, and photo gift books. 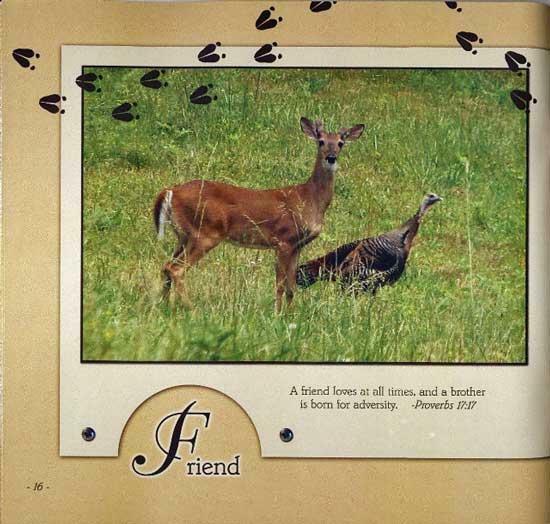 Tracking Through God’s Word began as a way to share our deer with friends and nephews back home. With a good zoom lens and some patience, anyone can enjoy photographing wildlife. Expensive equipment is great, but not essential. Since a back problem discourages me from carrying the heavy stuff, I now pack a Canon which weighs about a pound. Equally critical elements of wildlife photography are lighting, and being in the right place at the right time. You become a student of light, color, and “quick on the draw.” If you’re the competitive type, check the Internet for magazines sponsoring photo contests, and stock photo companies who buy excellent high-resolution images. This sure was a pleasant read this morning as I was catching up on the news of Cannon County. I too, carry a camera everywhere that I go. You never know what is just within our lens view. I have been trying for about ten years now to capture the wild geese that flies over our farm every year. I want a view from beneath that flock of beauty that passes by, I have come close, but never a picture that I have been completely satisfied with. I enjoyed reading about this ladies beauty at her place. I think God decided that she was entitled to be blessed with such beauty every day since thier ordeal with Katrina I hope the joy and beauty she sees every day over comes her homesick feeling.